When I started writing For Whom The Gear Turns I thought maybe, just maybe, someday a literary agent would contact me and offer me a free book to read and review. You can imagine my surprise when after only blogging for 6 months it happened! I worried a little that this would color my view of The Iron Jackal (Book 3 of The Tales of the Ketty Jay), especially after the giddy rush I got from opening the package when it arrived. But in the end, it gave me a giddy rush all on its own. 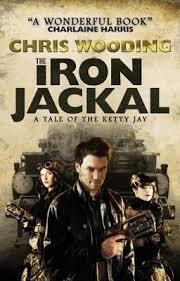 Chris Wooding has been writing the Tales of the Ketty Jay for several years, he is all the way through Book 5 in the UK. But, it was his US agent who contacted me, and told me that they were going to start with Book 3 for the American release on June 1. I was a bit skeptical about starting in the middle of a series, but it meant being dropped into a fully formed and complex world that was a joy to explore and made me even more interested to go back and read the earlier books. There are airship pirates, complicated relationships, daemon-imbued walkie talkies and multi-faceted cultural and political systems that overlap and contradict in a very realistic way. What’s NOT to like? I would absolutely recommend this book to anyone who is looking for a fun read, but doesn’t mind some moral ambiguity. Frey is by no means a “good guy” by nature, but his Archer-like humor and quest for redemption in Trinica’s eyes make him a very compelling hero. The rest of the crew also gets to be fully-formed people with loves, losses and secrets all their own, so in the end it is really an ensemble piece rather than a story just about Frey. There are some nuances of the political issues that I am sure that I have missed because of not reading the earlier books, but it still definitely holds together as a stand-alone novel and a great place to start exploring Wooding’s work. This entry was posted on June 6, 2014 by Phoebe Darqueling. It was filed under Books, Graphic Novels and Adaptations and was tagged with Airships, Book Reviews, Books, Chris Wooding, Iron Jackal, Ketty Jay, Pirates, steam punk, Steampunk, steampunk books. Just shows you have a great blog. Congrats. I have read the first two books and they are so fantastic that I had to pick up the last two, and not read them. I’m saving them because they are so good!